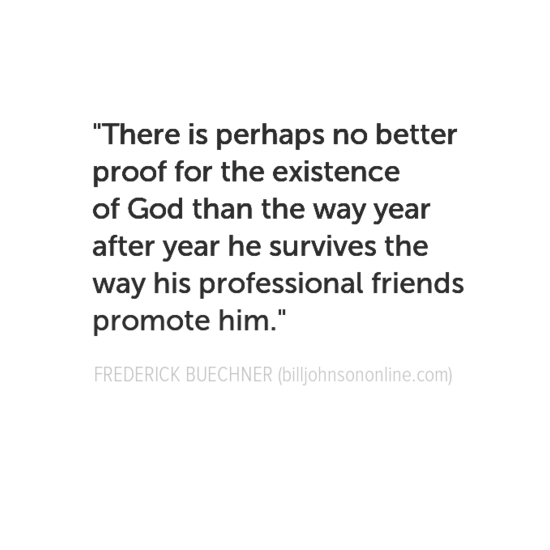 On Preaching - A Quote by Frederick Buechner. Spiritual Reminders Bill J.
I love to preach and have been a “professional” preacher for many years in my life. I’ve preached some bad ones and good ones. And many times the ones I felt good about didn’t seem to have an impact and the ones I felt lousy about seemed to touch people the most. But I found this quote both amusing and sad. There’s a lot of bad preaching out there, but God survives it! What a great proof for God’s existence and for God’s persistence. Buechner also said, that it’s not so much what we hear in a sermon, but the most important thing is that our hearts were touched? It’s simple, but I think that’s what makes the difference. A preacher can be eloquent and even convincing, but without having been touched by God and moved in his or her heart, the sermon will fail to touch the hearts of others. And touched by what? Touched by love, grace, hope, truth and the communication of it. Preachers out there – I don’t want your fill in the blanks. I don’t want your eloquence. I don’t want your ego. I don’t want your reasoning and rationale. I can get on any channel. I want to know and hear from your heart how you’ve engaged with the heart of God. The one thing I do miss is the opportunity to preach in church. So, until then, if that day comes again, I’ll do a little preaching online for five minutes a week to whoever may tune in for Simple Sunday Sermons. I often feel foolish, but that’s never stopped me before! And I sometimes wonder if I should continue, if it makes any kind of a difference for anyone. But no matter, because my heart is being touched and I’m preaching to myself on what I need to continue to learn and experience in my own heart, mind and life. So, touch my heart God. Move me, speak to me, touch me, so that I also may touch the hearts of others as I speak, teach and preach and am.